Workshops are scheduled at Noon on Wednesdays and 6 p.m. Tuesdays. Please see schedule for specific dates. Pleae Note: ALL Workshops offered by the Writing Center are held in 411 Central Library. 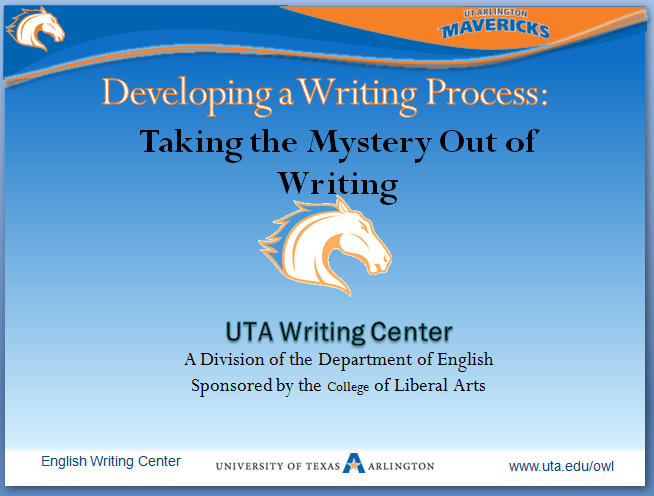 Seats are limited and attendees must register and make an appointment for the workshop on the Writing Center schedule. The Writing Center will cancel workshops with insufficient enrollment. Attendees will be notified in the event of cancellation. 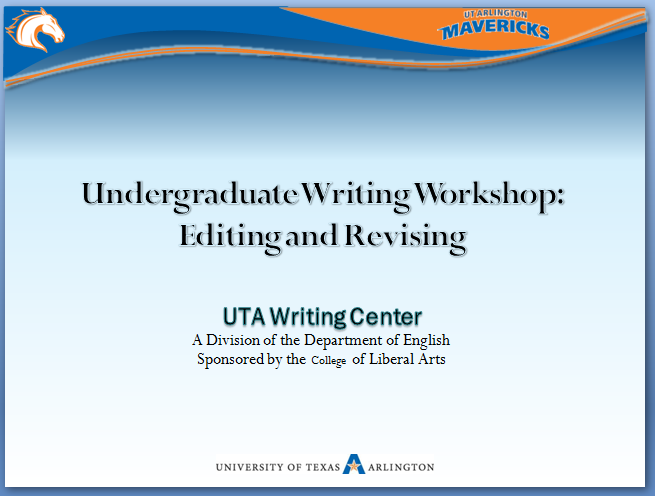 Editing and Revising: Students should bring a draft or a previously graded writing assignment to this workshop. In addition to helping students better understand the differences between editing and revising, these workshops will allow students to put these skills into practice in a friendly environment in order to demonstrate how editing and revising can improve their writing projects. Establishing a Writing Process: An important skill for all college students is sound writing practice. Most students need help to create a writing process that works. These workshops will provide key strategies and tips for establishing a process that will help students get through writing projects. 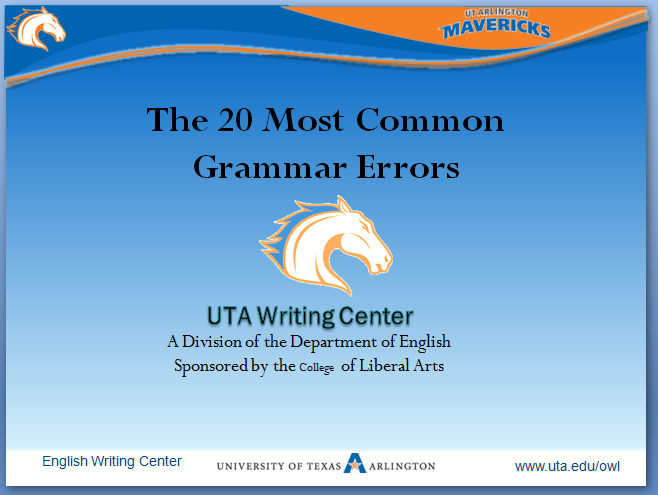 Common Grammar Errors: Explores the most often identified grammar errors in student writing and provides tips on avoiding, recognizing and correct these before submitting final drafts. 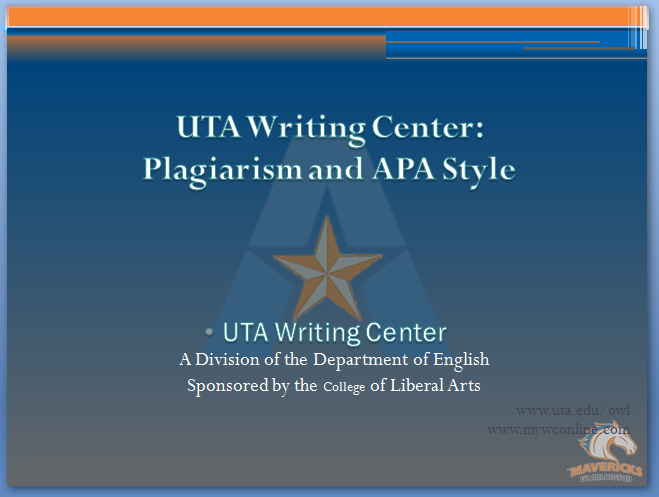 Plagiarism and Citations: Workshop will focus on understanding rules related to plagiarism, including identifying when to include in-text citations for paraphrases, direct and indirect quotes. Will also briefly discuss using the appropriate handbook as a guide to writing essays and documenting sources, but is not intended to be comprehensive review of the use of any particular style guide. Undergraduate Assignment Comprehension: These workshops are not disciplinary specific, but instead offer guidelines for best student practices when reading, interpreting, and tackling academic assignments and projects. 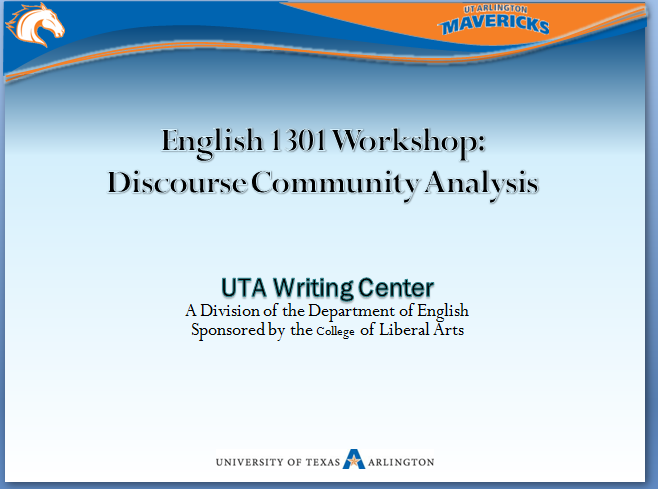 Discourse Community Analysis: The discourse community analysis is a paper that focuses on helping students to master the uses of rhetorical concepts by applying them to familiar topics. This workshop will help students become familiar with the requirements of the discourse community analysis.. 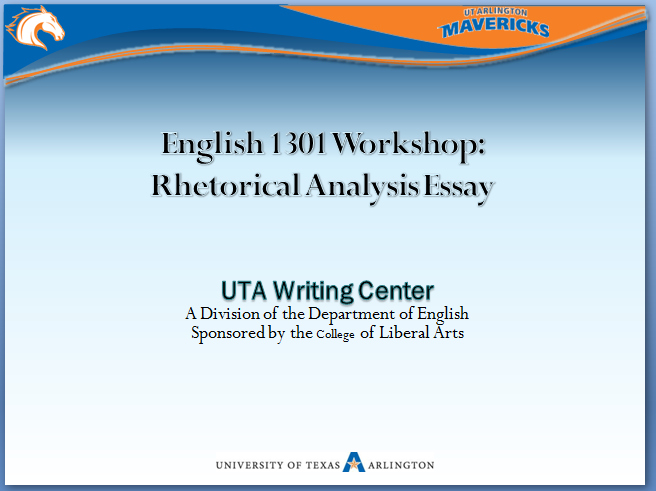 Rhetorical Analysis: The rhetorical analysis is meant to help students understand the role of exigency and audience in already existing conversations. 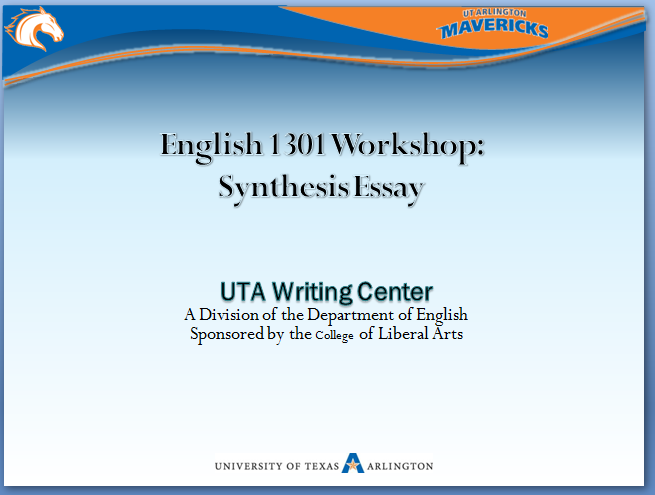 This workshop will help students become familiar with the requirements of the discourse community analysis..
Synthesis Essay: The synthesis essay is meant to help students fully understand the conventions of academic writing by applying all the rhetorical concepts discussed throughout the term. This workshop will help students become familiar with the requirements of the discourse community analysis..
Issue Proposal (IP): These workshops are designed to help students enrolled in 1302 with the first writing assignment in the FYC Spring sequence. Workshop will review the assignment requirements and identify the best approach to completing the assignment according to the demands of the project. Annotated Bibliography (AB): The annotated bibliography is an important genre in academic writing that has specific content and style requirements that may be unfamiliar. These workshops are developed to help students respond to the specific requirements and to become familiar with ways of providing judgment free analysis of potential sources. 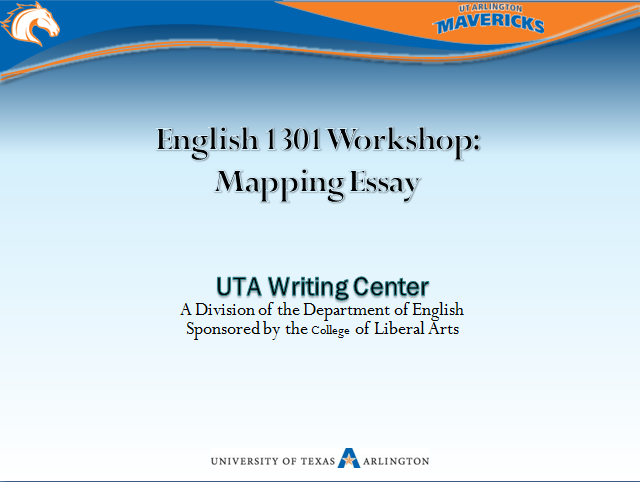 Mapping the Issue (MI): Explores the criteria for the Mapping the Issue writing assignment for students enrolled in 1302. In keeping with the other freshman writing workshops, rhese are intended to help students develop the skills necessary to complete the assignment and become academic writers. Researched Position Paper Part I (RPP): Workshops cover the final sequence in the 1302 writing program. These workshops ensure that students understand the assignment. Researched Position Paper Part II (RPP): In the second RPP series, students should bring a draft so that they can begin refining their final writing project. If you have suggestions for additional workshops, or to request a workshop in your classroom, please email us at clought@tua.edu.